Project managers face a unique challenge in construction planning because they have to calculate the most efficient and cost effective way to build a design, while clearly communicating the construction process to clients and other stakeholders. Recently, project managers have adopted 3D modeling and 4D scheduling programs to help in this critical phase of the construction project. 4D modeling combines 3D drawings with a construction schedule and displays the sequence of construction over time. Syncro has developed a plugin for Google SketchUp along with their full line of 4D systems for various sizes and types of construction management teams. Synchro has been developing innovative scheduling systems since their start in construction software 2001. Syncro’s software integrates models from popular CAD programs like Google SketchUp, as well as Revit and Auto CAD, and then synchronizes them with a project timeline on a spreadsheet. The result is both a visual and spatial representation of construction as it occurs through time. 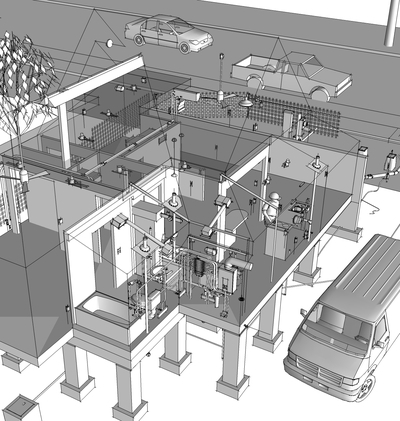 This innovative new 4D plug-in for SketchUp was introduced at the 2008 CMAA conference in San Francisco and Software Advice, an online resource that helps construction companies find construction management software, was there to capture the importance of Syncro’s new 4D tools. Their video of the plug-in can be seen below or on the Software Advice website. The viability of 4D modeling software as an effective planning tool has prompted much discussion among leading construction professionals. So much so, that Stanford University’s Department of Civil Engineering held their own research study. Their study reveals that project managers and stakeholders can indeed understand a construction schedule more quickly and completely with a 4D visualization. In a real world scenario, 3D and 4D construction modeling software has definite advantages. Construction projects are complex, and modeling software helps project managers anticipate and plan for delays and miscalculations. Now 3D construction modelers can use SketchUp to track their projects in 4D ! !